In The Super Bowl Ad Game, One Small Business Will Win Big This year, one lucky little company's professionally produced commercial will air during the Super Bowl's third quarter — all free — thanks to a contest held by the software firm Intuit. 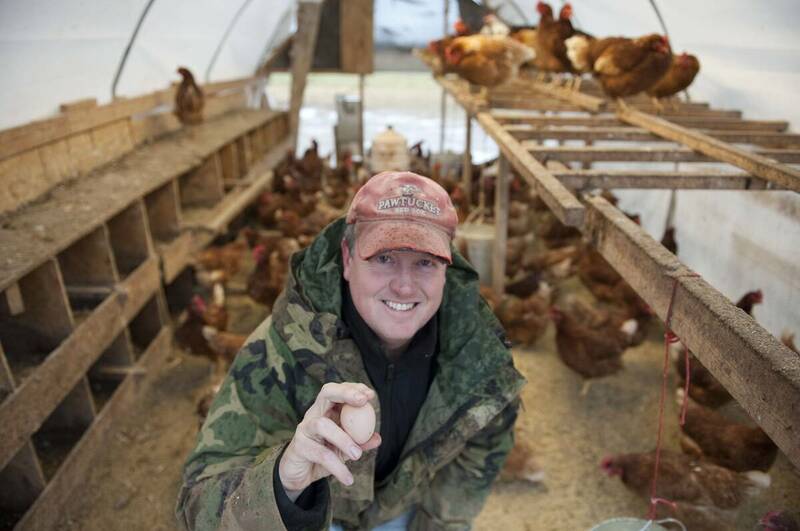 The four finalists include an organic egg farm and a natural compost supplier. For Intuit, it's a smart way to drum up more business. Jason Amundsen of Locally Laid Egg Co. is one of four finalists in Intuit's Small Business, Big Game competition. Intuit says some 15,000 small businesses entered the contest. Super Bowl suspense is building — for the game and the commercials. With an audience of over 100 million people, advertisers covet this space, but at a reported $4 million a spot, only the mightiest corporations can afford Super Bowl exposure. This year, though, there's an exception. One lucky little business will get one of those primo slots — free. Intuit, the company that sells software tools including Quicken and TurboTax, is sponsoring a promotion called Small Business, Big Game. It's giving a professionally produced ad during the Super Bowl to the small business with, among other things, the most votes and the most inspiring story. Intuit says some 15,000 small businesses entered the contest, from an organic ice cream truck in Los Angeles to a pet spa in Ashburn, Va. Call it American Idol for little entrepreneurs. Small businesses are among Intuit's primary customers — and it wants more. "Our concept is all centered around the fact that small businesses are the unsung heroes of our country," says Heather McLellan, Intuit's director of corporate communications. "So the whole idea was, 'How do we put them on the world stage in a way that's never been done before?' And that led us to the concept of a commercial on the big game." "I can't walk down the street without someone asking me if we've won," says Lucie Amundsen of Locally Laid Eggs. She and her husband founded the business. They sell eggs to local restaurants and grocery stores. She says they're thrilled they've got a 1 in 4 shot at reaching over 100 million people during the Super Bowl, something they could never afford on their own. Amundsen says just making it this far has paid off. She says they've been getting a ton of free media coverage from local fans. "We had lawn signs, homemade signs in storefronts ... a free billboard," she says. So in the same way American Idol can catapult a singer to stardom, the winner of Intuit's contest could see its business explode. And what's in it for Intuit? Advertising expert Barbara Lippert, who writes a column for Mediapost.com, says this is brilliant PR and marketing for the software company. "It's a really good strategy because when you hear the word 'Intuit' you have no idea what it is," Lippert says. Lippert says not only is Intuit getting its name out there, but it's helping potential customers grow "and hoping that they will become huge customers once they become huge businesses, so it's a really good bet." There have been some hiccups in this promotional contest. The marijuana advocacy group NORML entered and did extremely well in the voting, but it didn't make it to Round 2. McLellan says popularity wasn't the only criterion. Intuit's panel of judges "valued businesses over causes," she says. "The second round, when we got to the 20, it was based on a number of criteria," McLellan says. "Some of those criteria, as you can imagine, are, 'Does it represent the Intuit brand?' "
Another snafu: The girls'-toy maker GoldieBlox from Oakland, Calif., did make it to the final four but became involved in a legal battle when it adapted a Beastie Boys song in one of its videos but never asked the band's permission. McLellan says Intuit is not getting involved. The winner of Small Business, Big Game will be announced on Jan. 31.